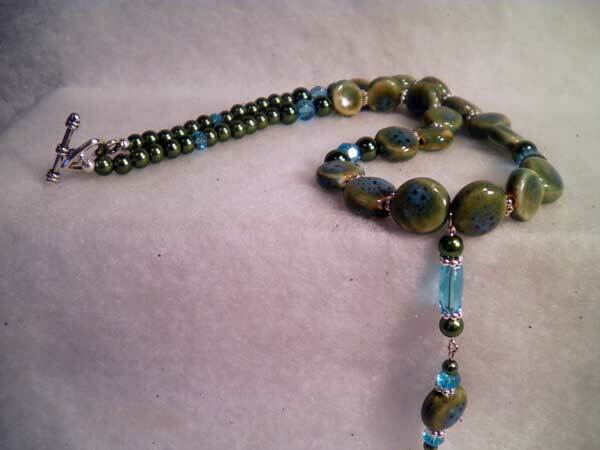 Ceramic button beads in olive green and sky blue set the stage for this fabulous 20" necklace. The dangle, which adds another 3 inches is made up of olive pearls in two different sizes, blue faceted glass rondelles, a blue faceted glass rectangle and silver spacers. Large and small olive pearls, more faceted rondelles and blue faceted rounds make up the rest. It is finished with a heart toggle clasp.